We’d love your help. Let us know what’s wrong with this preview of El jardín de bronce by Gustavo Malajovich. We’d love your help. Let us know what’s wrong with this preview of Many Lives, Many Masters by Brian L. Weiss. We’d love your help. Let us know what’s wrong with this preview of Batman by Alan Moore. She has read 4 books toward her goal of 22 books. We’d love your help. Let us know what’s wrong with this preview of El tatuador de Auschwitz by Heather Morris. Grupo creado con la finalidad de buscar gente afín con la que poder compartir tu próxima lectura. 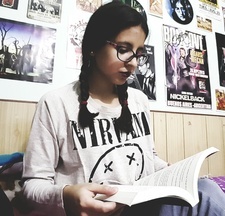 Luz has read 4 of 22 books. Luz read 23 books of her goal of 20! Luz read 61 books of her goal of 40!